My giant buddy Joel went to Boracay at the beginning of September, so he was able to scope out some places for me to try. One of the places he mentioned to me was Jonah's Fruit Shakes. Naturally I told him that i'm not really into fruit shakes, but he said not to worry because there are other things on the menu as well that would probably interest me. In fact, on his part, he didn't order a fruit shake. He ordered a chocolate peanut butter one. 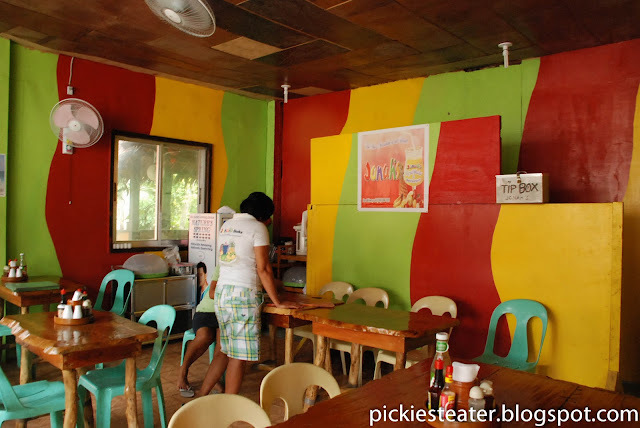 Sounded good to me, so I marked it down on my list of places to try during our Boracay trip. The problem was, I thought I heard him say it was at D' Mall, which it isn't. So after a few minutes of walking around D' Mall looking for it, I gave up my search. Rina stopped to talk some pictures, and she was surprised to see I had turned the corner and was about to enter a tiny alleyway. She was just about to ask where i was going when she looked up and saw the sign and understood completely. I had finally found the ever elusive path that would lead me to Jonah's. Nope, no beef patties for sale here. 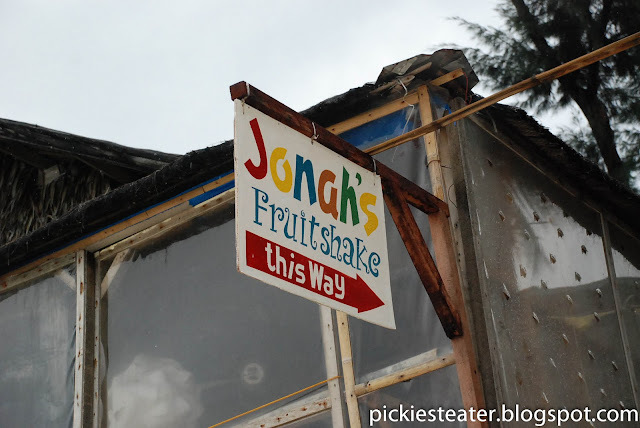 Jonah's Shakes looked like a Jamaican beach shack. It's a comfortable little nook that gives you the ultimate island experience that Boracay is known for. It was breezy, (off peak is the best) and despite the fact that the entrance was near the traffic of the street, it was rather relaxing. I ordered the Banana Chocolate Vanilla Shake (P90), instead of the peanut, because that sounded more like me (Not a big fan of Peanuts, although I do love Reeses' Pieces) and I really enjoyed it. It came in, what looked liked an old Mineral water bottle with a hole drilled through it so a straw could fit through (See first picture). Perhaps not the most hygienic way to serve a shake, but the fantastic taste could not be denied. It had a creaminess of the vanilla fused perfectly with the richness of the chocolate.. and the Banana added a light touch of sweetness to the shake. The ice was blended down just right so that you wouldn't need one of those Jumbo Zagu type straws. When I glanced through the Menu of Jonah's shakes, I managed to spot a sandwich that caught my attention. 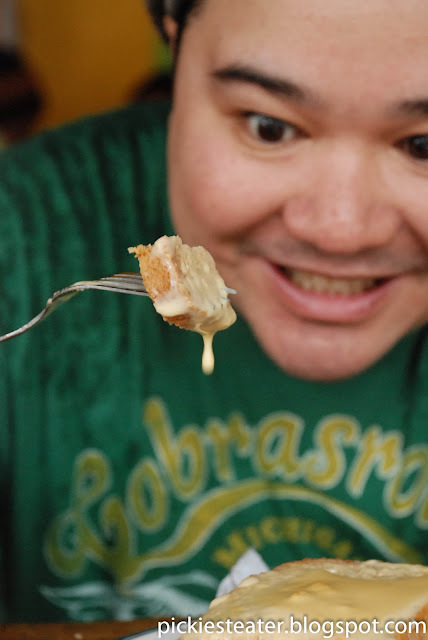 One of their creations was called "Hot Stuff" (P100), and it was described as "Ham, Cheese, cooked in butter sauce with Mustard". Music to my ears. And though we had breakfast just a few hours ago, I could not resist. The waitress placed the sandwich on my plate and you can't help but be enamored with it. It is rather easy on the eyes. The sandwich was so covered in buttered cheese sauce, that you could barely see the actual bread anymore. The aroma of the cheese was mouth-watering. 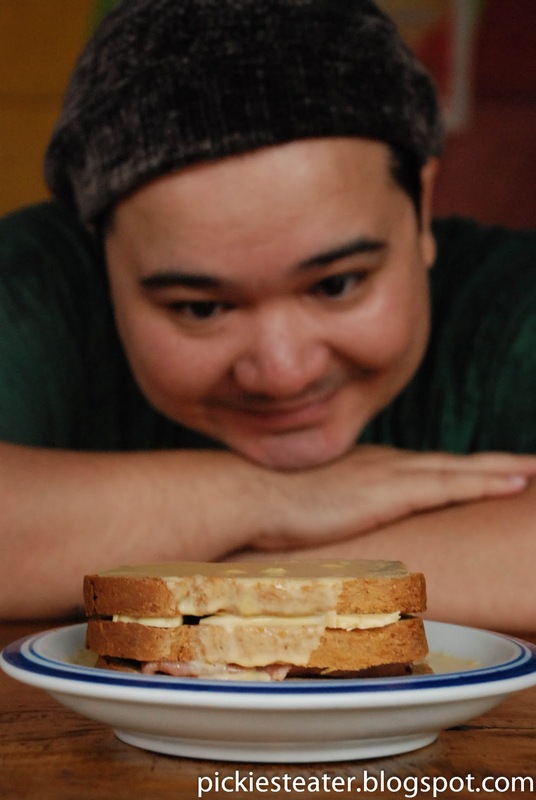 And in case I hadn't mentioned it yet - if you're a cheese lover, (*Cough* Rain DG *Cough*) This sandwich is for you! 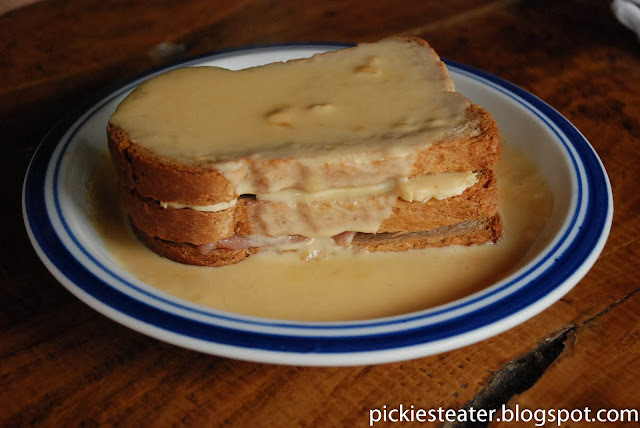 The cheese sauce was delicious, and it really took the sandwich to another level. I'll be honest, the sandwich did have its flaws. The first being, the bread was a tad bit dry. Second, the Cheese inside the sandwich was just a slice piece of cheddar-they didn't bother to use quickmelt. 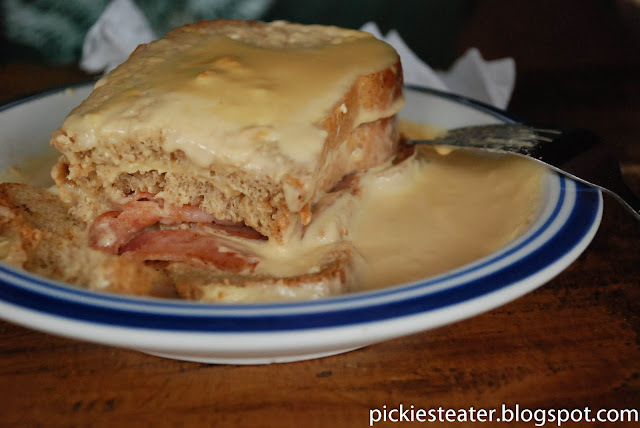 Third, I couldn't taste a single dab of mustard in the sandwich at all, and lastly it could've used more ham. But like I said, if you're a cheese lover, you might be willing to see through all those flaws. Fork your sandwich, rub it all over the sauce, and you're golden. It was like a cheese explosion in your mouth with every bite. To be honest, it didn't look all that difficult to make. But it was a sight to behold, nevertheless. It was so cool watching the cheese drip. Then Rina had to get mad at me. Something about "playing with my food". Pssh. I loved how the cheese would drip off with every forkful. I'm just curious why they used Whole Wheat bread. Did they honestly think that a person who'd order a sandwich loaded up with ham, cheese and butter, would want it on whole wheat? Jonah's has amazing shakes, and pretty creative sandwiches, all at reasonable prices. If you do go to Boracay, Add Jonah's to your list of stop overs. You won't be disappointed. Banana Chocolate Vanilla shake--->sounds mighty fine. 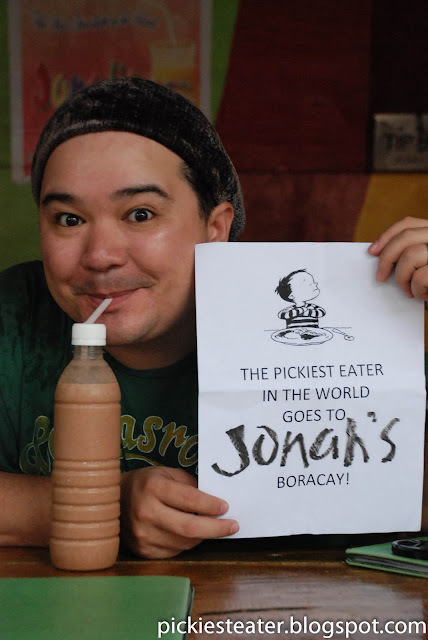 I shall take your word for it and try it myself hehehe Jonah's i'll see you in 10 days!